With his win yesterday, James moves onto Page #2 of our ToC Tracker. He’ll move onto Page 1 with a win today. Correct response: What is a quantum leap? Oh, boy! The physics definition of a quantum leap is “the discontinuous change of the state of an electron in an atom or molecule from one energy level to another” (source). However, it’s best known today as a metaphor meaning a fundamental shift, which also named an early ’90s television series starring Scott Bakula. An average of 2.528 5+-time champions (standard deviation 1.6756). An average of 3.9365 4+-time champions (standard deviation 2.42). An early cutoff took place 3.182% of the time (or a 5-game winner will be left out). 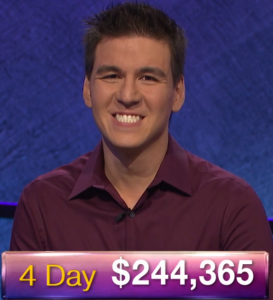 James Holzhauer qualified 99.025% of the time. Eric R. Backes qualified 87.112% of the time. Anneke Garcia qualified 58.422% of the time. 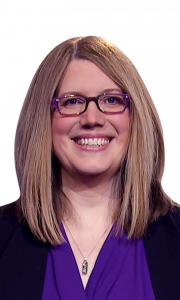 Lindsey Shultz qualified 28.532% of the time. Dave Leffler qualified 8.763% of the time. Jonathan Dinerstein qualified 0.827% of the time. The previous record through 4 days: Roger Craig ($166,801). Roger Craig also held the one-day record, at $77,000, set September 14, 2010. James’ winnings of $244,365 place him 8th all time in regular play, 33rd all-time including tournaments. No champion has ever won $244,365 or more over their first 5 days. Adjusting for doubled dollar values, Frank Spangenberg held that record ($102,597, adjusted to $205,194). The 6-day record is $257,700, held by Austin Rogers. 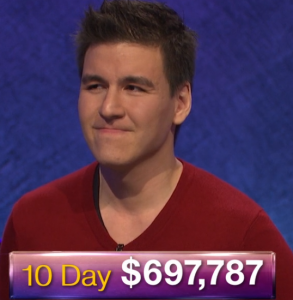 James is believed to be the 16th different player to hold the single-day winnings record on Jeopardy. James’ Coryat score of $35,400 is tied for the 11th-highest single-game Coryat of all time. 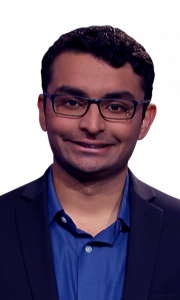 8 of the top 10 belong to Ken Jennings; the only two that do not belong to Jerome Vered (pre-doubled $17,900 on May 21, 1992) and Wes Ulm (pre-doubled $18,000 on June 4, 1997). The overall record high Coryat score is $39,200. Effective in first on buzzer stats: James 64.29% (36/56), Sameer 12.50% (7/56), Ariana 23.21% (13/56). 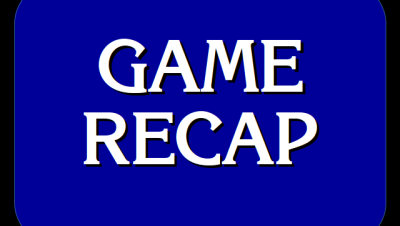 30 Comments on "Today’s Final Jeopardy – April 9, 2019"
If Roger Craig sees this, what will he say??? I get the sense, at least from this tweet yesterday, that he’s almost expecting his record to fall. 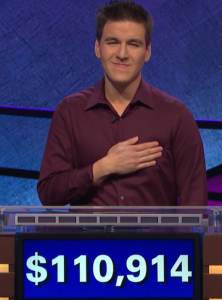 I believe all of his final jeopardy scores so far have been important dates or something, so I’d guess 11/09/14 has some meaning. Birth of his daughter, if I’m not mistaken. That’s a very good suspicion! Didn’t know about the dates…thanks guys! All I can say is OMG! I look forward to seeing it live. Even if he somehow lost tomorrow, do you really think the producers would want to hold a ToC without him? I think he also broke a record for the decibel level of the audience gasping. I feel really bad for the contestants going up against him. They go through so much to get there and there’s just no hope. Since he’s a professional gambler, I wonder if there’s an over/under in Vegas on the number of games he’ll win. There couldn’t be betting on it because some people already know the result. They’re not going to open up bets when such an asymmetry of information exists. I was joking, but I didn’t think of that. For all we know, he’s still winning! That news would make the 4-timers on the ToC Tracker very happy! No hope? Someone will beat him eventually, and I doubt it will be someone who simultaneously does something like break his single-day record. No one who walks out on that stage should feel hopeless. Every single person who walks out on that stage to face him should be walking out to beat him, not resigning him or herself to four figures and a story about getting clobbered on television. Well, we’ve no proof yet that someone will eventually beat him. It’s a little like being the 16 seed playing the #1 in the tourney. Their chances of winning are still severely diminished. Maybe, but you never know what’s going to happen when that game starts. I wouldn’t be surprised if he broke his own record before his run ends. 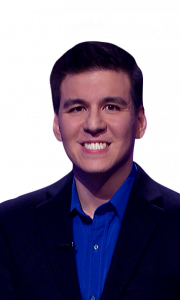 Seems like he broke every possible record tonight except for Ken Jennings 74 game win streak. Whoever eventually beats him will probably fall to the Giant Killer curse and only win 1 game. The amount of the FJ wager was also a record, yes? The $25K DD bet was so nonchalant that the fact it was the record for a single DD bet was a distant afterthought. Even if he’s wrong he still has a lock game. Just damn impressive on all fronts. Roger Craig and Philip Tiu are probably going to have questions looking back at this game, because this James guy is LEGIT! Not only did he do what no contestant has done in many years in the double clue value era; make over $100,000 in one game, made the biggest DD bet (And got it right), broke multiple records by champions who won 4-9 games as champion, broke the record for most money heading into FJ!, and has the highest average ($61,091) by any contestant (Ken Jennings is probably second with $34,063 per game). If James secures his 5th win tomorrow, no doubt that he’ll be a big shoe-in to the ToC. The other contestants surely are going to have their work cut out seeing this guy when they seem him there.